The ‘Employee Form’ is fully customizable. Any number of text, memo, list, checkbox, number, date, or phone fields can be added to the form. Select any employee in the list to open their Employee Details form. When the Employee Details form appears, click the Edit button. At the bottom of the Employee Details form, select Edit Fields. 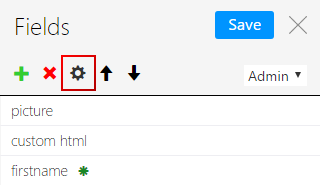 Select a field to edit, then from the top toolbar, select the Edit button. Edit the following properties of the field. 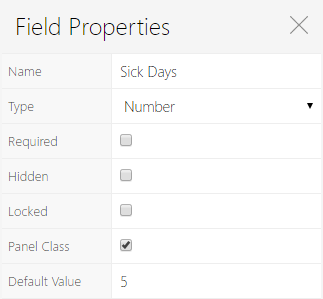 Some properties will display an icon on the Fields form indicating they have been activated. Name The label associated with the field. Type Select a field type from the list. The types are detailed in the table at the bottom of this page. Once assigned, the type can not be changed. Required Select to make this a mandatory field. Hidden Hide the field from display on the Employee Details panel. Locked Prevent any changes to the field. Edit Profile Allow users to edit the field. Panel Class Allow Panel Class styling. Default Value Apply a default value that will always be applied to the field. Creates a one line text field for short details (ex. Title, Department). Creates a resizable text box for larger details (ex. Notes). property can contain either a static list of values or a list generated from a query. For example the query “select [deskname] from [_desks]” will list all desks. Multiple queries can be entered. Creates a one line text field for numbers only (ex. Employee Number). Creates a text field that when clicked will show a calendar window to choose a date from (ex. Birthday). Phone Creates a one line text field for numbers in a phone format only (ex. 1.234.567.8900).